On this week’s edition of FUEL TV’s “UFC Tonight,” co-host and UFC light heavyweight Chael Sonnen (pictured) announced he has signed a five-fight contact to remain with the world’s premier mixed martial arts promotion. Chael P. is slated headline the UFC’s debut on Fox Sports 1 against Mauricio “Shogun” Rua on August 17. According to the chatty wrestler, he accepted the contest despite the fact his current UFC contract had expired. Sonnen was most recently TKO’d by reigning 205-pound king Jon Jones at UFC 159. Prior to that, the 36-year-old was put down by then-middleweight champ Anderson Silva in the most anticipated rematch in MMA history. Uncel Chael has posted a 27-13-1 professional record over his controversial 16-year career. 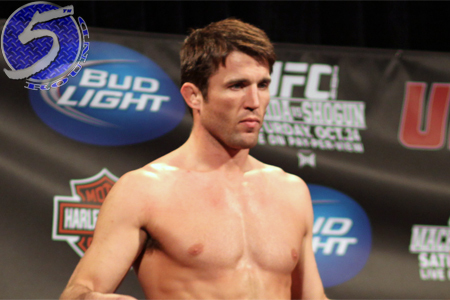 Sonnen is one of several UFC fighters competing under the assistance of testosterone replacement therapy (TRT). In addition to confirming his new contract, Sonnen said he has moved his camp to Mark Munoz’s Reign Training Center in Lake Forest, California. Also, he plans to drop back down to middleweight after facing Shogun.